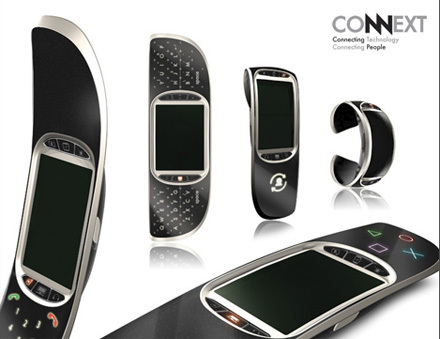 Connext – A glance into the future world of gadgets! This news post was published in 2007 and is now archived and no longer updated. Have you ever wondered if in the future you’ll still have to carry along with you, your watch, your mobile phone, DPA or PMP? The answer is simple: NO, because you’ll have at your disposal gadgets that will replace very well all your past gadgets and a lot more. An example of these future gadgets is the one conceived by James Zhang, “Connext,” now it’s only in profile phase, based on a modern interface, great design, and high functions all that made for making the owner’s life easier. It could be fantastic for those who do lots of mobile work on the road or work from home. 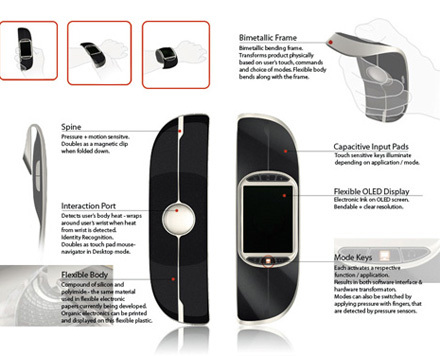 This gadget features an OLED display in the centre bounded by flexible and sensitive facets when pressing or moving, these facets are actually playing the role of the well-known keys or buttons. So we have a completely ductile electronic device which can adapt at any of the owners desires. By choosing the right function of the menu, Connext becomes a computer, a multimedia player, a personal assistant, a mobile phone or a console for different games. Also to make it more handily, the gadget can easily become a simple watch by attaching it to your wrist. New concepts are always interesting. Probably for the people that lived in the 50’s, it would have fascinated them to have their own computer just like we are fascinated now by this new gadget Connext. One thing is for sure, technology is evolving rapidly, and the necessity of an all-in-one product which can be carried along easily, that must also have a great look, is more than obvious.